Long live the 14th of July! Bastille Day, the French national holiday, commemorates the storming of the Bastille, which took place on July 14, 1789. As in the US, where the signing of the Declaration of Independence signaled the start of the American Revolution, in France the invasion of the Bastille began the Great Revolution. Although the Bastille held only seven prisoners at the time of its capture, the raid was a symbol of liberty and the start of the fight against oppression for all French citizens. Today, the day is commemorated with much merry making, revelry and of course, wine drinking! As we Americans tend to do, it seems only appropriate to join in the celebration, which gives us cause to celebrate everything French, oui? And since almost all of the most famous grape varieties originated in France or became famous through French expression, we think toasting to our fellow red, white and blue’rs should be done in the French spirit, non? The diversity of French wine is due in large part to the country’s wide range of climates – just like ours in California. It’s cooler in the north, warm and dry in the Rhone Valley to the south; there’s coastal effects and all sorts of continental and Mediterranean influences throughout the land. And like us in the Temecula Valley, whether you’re a lover of Chardonnay, Cabernet, Merlot or Sauvignon Blanc – or you’re more a devotee of Bourdeaux or Rhone style blended wines, there’s a little something for everyone. So, we say Santé! And add a warm merci beaucomp to the French! Click here for some great French varietals, Temecula Style! Newly released, Pas Doux, means “not sweet” in French. A full bodied, bone dry rosé wine with a honeysuckle aroma and and wonderful flavors of pear, guava, grapefruit and lemon zest. A staple of the French table! Dark rich garnet in color; opulent flavors of dark red cherries and cassis on the palate. Soft and subtle with a long, lingering finish with a hint of smoke and cocoa. A full-bodied blend of Cabernet Sauvignon, Merlot, and Cabernet Franc. Deep ruby red in color, rich in flavors such as black cherry, blueberry and pepper with well integrated tannins. A traditional blend of 40% Cabernet Sauvignon, 40% Merlot and 20% Cabernet Franc; toasted vanilla and caramel nose with black cherry and plum fruit finish. Oh yeah, and if you happen to stop by Palumbo Family Winery today, it just happens to be Nick’s birthday, too! This just in! 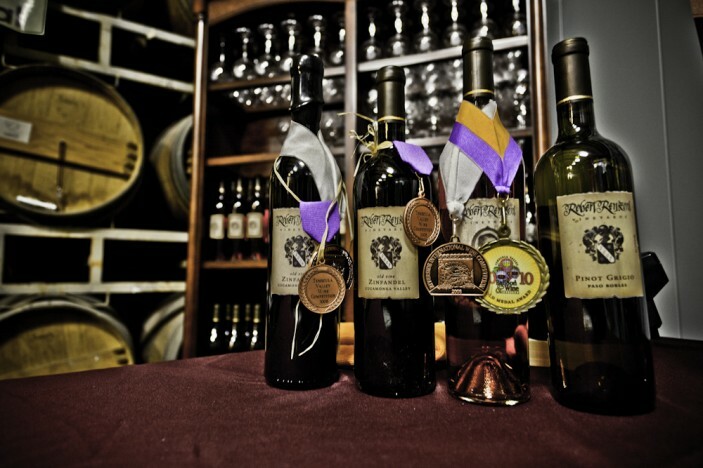 Temecula Valley brings home multiple medals from the 73rd Annual Los Angeles International Wine Competition! Nearly 3,300 wines were entered, tasted by a 72-member panel comprised of international judges. Judged in May 2012, there were many strong contenders, varietals and price ranges represented. For 73 years, the Los Angeles International Wine & Spirits Competition has showcased the finest domestic and international vintages through a wine-tasting event that is widely considered to be one of the most prestigious in the United States. The competition is the platform for an extensive wine education program available to the nearly 1.5 million visitors at the annual L.A. County Fair. With the L.A. International Wine & Spirits Competition committed to educating the public about wine, the Fair’s wine education program features industry experts with extensive knowledge about wine growing and selection, wine tasting as well as wine and food pairings. Congratulations to Best in Class winners Van Roekel and South Coast Winery for their Viognier and Riesling, respectively. See all the winners from the LA International Wine Competition here!